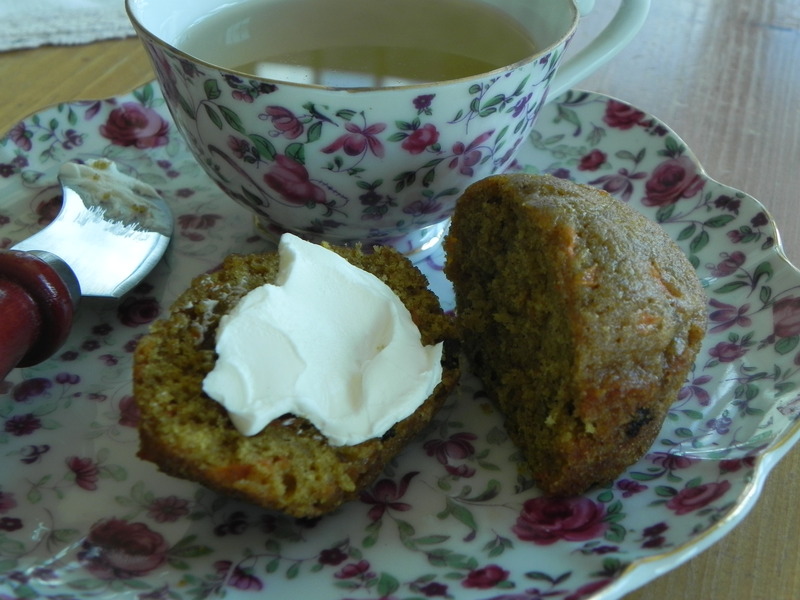 Almost like starting the day with a wedge of carrot cake, these muffins are favorite grab-and-go breakfast in my house, sliced in half and sandwiched with fat-free of lowfat cream cheese. They’re packed with wholesome ingredients: whole wheat pastry flour, grated carrots, currants and toasted pecans. The secret ingredient is carrot baby food which keeps them moist without a lot of extra fat. For more protein and calcium, try a smear of fat-free or lowfat ricotta cheese instead of cream cheese. One of these carrot muffins has almost 40% of the Daily Value for vitamin A, a nutrient under-consumed by many, according to the new Dietary Guidelines, 2010. Carrots are rich in the pigment beta-carotene, a pre-cursor to vitamin A (it is converted to vitamin A in the intestine) which colors some fruits and vegetables bright orange, yellow and dark green. Preheat oven to 350°F. Adjust oven rack to center position. Line 12 muffin pan cups with paper liners or coat with nonstick spray. In large bowl stir together whole wheat pastry flour, all-purpose flour, granulated and brown sugars, baking powder, cinnamon, soda and salt. In separate bowl, whisk together eggs, carrot baby food and oil. Stir liquid mixture into flour mixture, stirring just until blended. Stir in carrots, currants and pecans. Spoon batter into muffin cups, dividing evenly. Bake in center of oven for 15 to 18 minutes or until pick inserted in center comes out clean. Cool muffin in pan 5 minutes; remove to wire rack to cool completely. Makes 12 muffins.